I found Lola and her two siblings by the side of a house in Van Nuys. Their feral mother watched as I scooped up the trio and took them away to safety and to a better life. I've been their foster mom since they were a month old. Lola is extremely sweet. She loves to sit on your lap and make biscuits and purr. She also will come running into the bathroom when I'm there just to be pet. I've seen her throw herself down with affection. It's really fun to watch! She was a little sick With an eye infection when I first got her. Now she's doing amazing and I'm so happy! She's a lovely kitten and I want her to go to a terrific home. 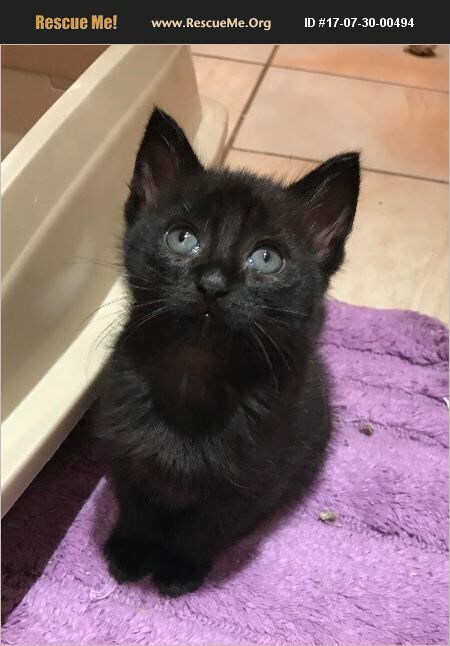 It is Www.kittenrescue.org's policy that no Kiten should be adopted alone therefore please consider adopting Lola with one of his siblings, Oscar/Lucy or another kitten. You can also have a playful dog at home. She cannot go to a home alone.